Published By – Who Is She? Music, Inc.
Design – Jeri Heiden, SMOG Design, Inc. Mastered at Gateway Mastering Studios, Inc.
All songs published by Who Is She? Music, Inc. (BMI), except for "Halfway To The Moon", published by Keyed Music (BMI). ℗&©2014 Phish. Manufactured and distributed by ATO Records for JEMP Records. Musically, this pressing/mastering job is outstanding. I mean, the pedigree here is what you want to see (Pallas pressing, cut at Grundman Mastering, Bob Ludwig, etc.). But a seemingly minor edge warp starts the issues, and then Fuego skips all over the place. My system, which isn't crap, tracks records like it's on rails. Apparently not so with this. Very frustrated. any idea on how many copies were printed in this orange colored vinyl? No problems or skipping noted with my copy. Sounds great. My copy sounds excellent with no distortions or sound degradation. Lots of sibilance on my copy, as well as at least one other copy I've heard. This is now sold out on Phish.com It is however, available for pre-order as black 180g vinyl to be shipped sometime in August. 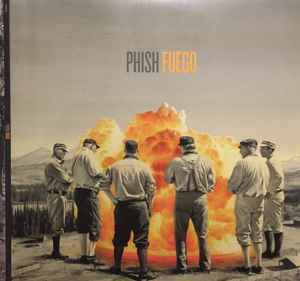 Another fine release from Phish, although it took a few years to get this out but well worth it especially on translucent orange vinyl. The wax when pressed has a wavy effect to it when held to a light.